Hybrid picking is an electric and acoustic guitar technique that involves a mixture of plectrum ‘flatpicking’ and fingerstyle technique. The style is most synonymous with players such as Chet Atkins, James Burton or Tommy Emmanuel, who were in turn inspired by bluegrass banjo masters like Earl Scruggs. The traditional method is to hold down chord shapes with your fretting hand and use your pick and fingers to arpeggiate repeating patterns. But hybrid picking is not limited to one particular genre. 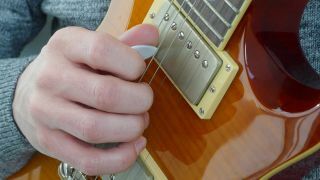 For example, modern fusion players such as Brett Garsed and Tom Quayle use the technique to play melodic arpeggios and to enable smooth legato lines without the need for moving the pick from string to string; instead, using the pick and fingers as four independent ‘plectrums’. This is much more economical than moving a single pick from string to string. Here, we will be utilising all of our available digits including the oft-forgotten fourth finger. The fourth finger is the smallest and weakest of our fingers, but it packs enough punch for the purposes of string plucking, so with a bit of practice it will become a very useful addition to our arsenal. We can describe fingerstyle patterns as forward or backward ‘rolls’. This essentially means using our pick and fingers to arpeggiate chords from low to high, or high to low. To familiarise yourself with this concept, try playing Example 1 to get to grips with these two rudimentary elements. The first four notes move from the lower strings to the higher strings and are therefore referred to as a ‘forward roll’. If we focus on the picking hand, the pattern starts on the fifth string with a downstroke, then use your second finger to pluck the fourth string; this is labelled as ‘m’ in the notation. Next pluck the third and second strings with your third and fourth fingers, labelled ‘a’ and ‘c’. For the backward roll, play the last three notes of Example 1. Start by plucking the C note on the second string with your fourth finger, followed by your third finger and then your second finger on the fourth string. You can go back to the beginning of the bar to complete the pattern with a final downstroke with the pick. Repeat this bar over and over again until you are comfortable with both the forward and backward rolls. We have five examples using different chords in various areas of the neck. In each case the fretting hand is straightforward, and either involves holding a chord shape or moving a finger to create a bassline. As you go through the examples you will develop greater independence between your pick and fingers (think in terms of a pianist’s left and right hand). Your pick is the ‘left’ hand, so is responsible for the bass parts, and the fingers are the ‘right’, which plays the melody. The melodies in each example follow the same pattern; start with your second finger, then move up to the next string and pluck with your third, then move to the next string and pluck with your fourth. The tricky part is combining the melody with the bassline, so work through each example slowly and carefully before speeding things up. Hold an open C chord and pick the fifth string with a downstroke. Your second, third and fourth fingers then play a forward roll. Reverse the pattern starting with your fourth finger and descending the strings. Note: picked notes are notated with the stems down and the finger-style notes are written with the stems up. The example is a variation on Example 1 and this time is based on a C7 chord. Use the same picking hand pattern as before, but this time move your pick between the fifth and sixth strings. Hold the chord shape with your first, second and fourth fingers while moving your third finger between the fifth and sixth strings. First get used to playing the eighth-note bassline using your pick to play downstrokes throughout. Next use the second, third and fourth fingers to pluck the notes on the top three strings. Notice that the melody moves at half the speed of the bassline, so take note to see which notes should be played together. This example is a similar concept to Example 3, except this time the bass-line is played in a quarter-note rhythm and the top line melody is played at double the speed with eighth-notes. Try starting with the melody, then add the bass on every two notes. This part uses a steady eighth-note-based bassline played with the pick and 16th-note syncopation to add fingerstyle notes in-between. The bass and melody are played together for the first two notes only. The rest of the bar alternates between picked notes and fingerstyle notes.